Posted on March 31, 2016 by Sayan Chakraborti Tagged AstronomyScienceSupernovae	CommentsNo Comments on What made the youngest supernova remnant in the galaxy? What made the youngest supernova remnant in the galaxy? A diverse range of engines power supernovae. National Radio Astronomy Observatory (NRAO) and Harvard-Smithsonian Center for Astrophysics (CfA) have released a joint press release about our resent work on SN 2012ap. It is the first supernova with relativistic decelerating ejecta but with no GRB associated with it. Astronomers using the National Science Foundation’s Very Large Array (VLA) have found a long-sought “missing link” between supernova explosions that generate gamma-ray bursts (GRBs) and those that don’t. Posted on October 30, 2013 by Sayan Chakraborti Tagged Benjamin PeirceHarvardMathematics Genealogy ProjectNathaniel BowditchScience	CommentsNo Comments on Tree of knowledge? Not too long back I discovered the highly entertaining Mathematics Genealogy Project. You can look up lots of mathematicians, some physicists and even a few astronomers there. For example I can look up myself. If you keep clicking on the names of each person’s advisor, you finally end up with someone who did not have one or we have no clue. In case you start with my entry, you pass through Nobel laureate physicists from Harvard like John Van Vleck and Percy Bridgman. Finally you end up with Benjamin Peirce whose advisor was Nathaniel Bowditch. It seems Bowditch was a American mathematician, often credited with starting the field of modern maritime navigation. More recently, I took a trip with my family to Washington, DC. I was especially looking forward to see the Library of Congress. I had heard much about it, but one aspect that I was not aware of was the beautifully painted ceiling. One portion had what look like various trees of knowledge. Some of them were big and famous academic families from the arts, sciences and engineering. Among them I found the small tree, or maybe a potted plant, photographed above. 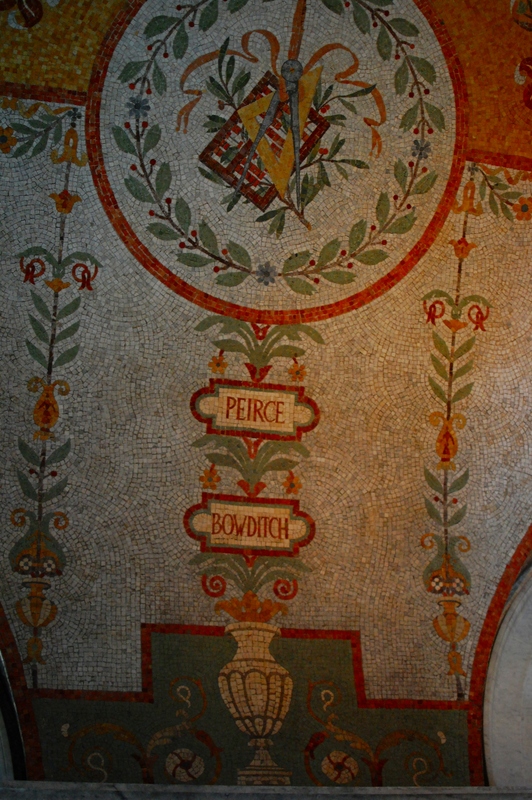 I could immediately associate Bowditch with Peirce, and I wanted to take a photo. It was a tight dark corner and I would not use a flash in a library. So, this is the best shot I could get. The centre of our galaxy, in the constellation of Sagittarius, harbours a gigantic black hole. Astronomers refer to it, in shorthand, as Sgr A* (http://en.wikipedia.org/wiki/Sagittarius_A*). Last year an international team of astronomers (http://arxiv.org/abs/1112.3264) spotted a gas cloud, called G2, on its way towards this supermassive black hole. A smaller team from Harvard and Arizona (http://arxiv.org/abs/1207.4215) went on to predict that the a bow shock around the G2 on its collision course, will accelerate electrons which will then produce radio synchrotron emission. G2 may be fly-weight compared to beast at the galactic centre, but the collision has the potential to teach us about our backyard supermassive black hole. This prompted a large number of observatories to initiate observational campaigns to monitor the galactic centre over the year. Swift is carrying out a daily monitoring campaign throughout 2013 to study the evolution of the X-ray properties of Sgr A* as it interacts with the G2 cloud. In fact the Sgr A* — Swift Monitoring Program 2013, has its own dedicated website (http://swift-sgra.com/). But this flare made me wonder. A gas cloud is a large and tenuous mass. It takes time to heat it up. For example if you try to heat up a gas cloud, of size R with a shockwave which can never travel faster than c, you cannot do it in a time shorter than R/c. Any flare from such a cloud which rises (or falls) in a time shorter than R/c would violate causality. This seemed to rule out an interaction with G2 as the origin of such a flare. Astronomers using the NUSTAR (http://www.astronomerstelegram.org/?read=5020) telescope found pulsations with a period of 3.76 seconds in the hard X-rays coming from this flare. Flares like this, with pulsations from them, do not usually come from supermassive black holes, but from Soft Gamma Repeaters (abbreviated as SGR http://en.wikipedia.org/wiki/Soft_gamma_repeater; no connection to Sagittarius) and not from supermassive black holes. So, astronomers decided to use Chandra, the X-ray telescope with the highest resolution available to us. The Chandra X-ray Observatory, named after Subrahmanyan Chandrasekhar, can resolve two X-ray sources less than an arcsecond away from each other. To put that into perspective; it is like being able to distinguish two strands of hair, half a millimeter away from each other, from a distance of 100 meters. This is what the team of astronomers (http://www.astronomerstelegram.org/?read=5032) saw using the Chandra. 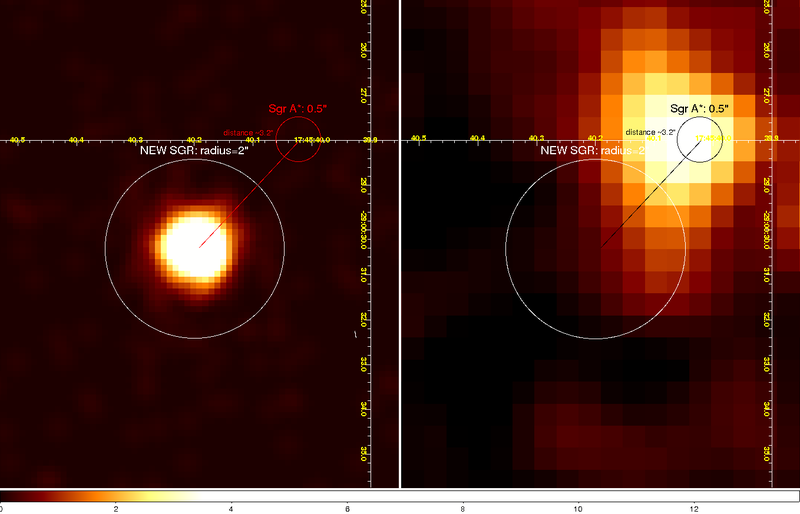 The right panel shows emission from Sgr A* seen in earlier observations. The left panel shows the source of the new outburst, merely 3 arcseconds away. This small separation could not have been resolved with the other X-ray telescopes. Radio observations (http://www.astronomerstelegram.org/?read=5035, http://www.astronomerstelegram.org/?read=5040) have now confirmed that this source is also a radio pulsar, consistent with the origin of SGRs from highly magentized neutron stars. Pulsars are neutron stars which emit radio and/or X-rays into an often narrow cone away from them. They also rotate very fast. This one rotates once every 3.76 seconds. Compare this to the 24 hours that the Earth takes to rotate. The Earth would actually rip itself apart if it was rotating this fast! This rotation points the cone of emission towards us like a lighthouse, once every rotation period, causing the pulsations. The line-of-sight distance to this object is still not certain, but this might well be the closest pulsar known to the galactic centre. So, what did I learn from all this? You’ll find new stuff if you are looking hard. But, you may not find what you were looking for. So, its important to keep an open mind for serendipitous discoveries. I had just joined the PhD program at the Tata Institute of Fundamental Research and was supposed to complete an experimental project. My adviser was Prof. Ojha who taught me photometry, the first thing about astronomy. 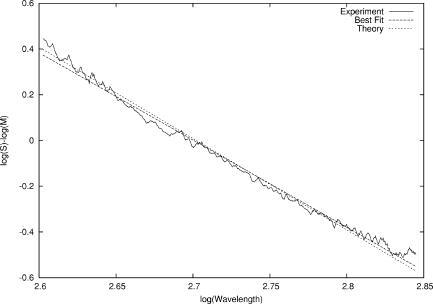 Photometry involves measuring the amount of light that you receive, say from a star, within a single fairly large range of wavelengths. My project was to measure the eclipses of the binary star Algol. Tarak, with whom I shared the only telescope we had, was learning spectroscopy. When you measure the amount of light received within many narrow ranges of wavelength, its called spectroscopy. The end product of this process is called a spectrum. We had not yet heard of dreaded Time Allocation Committees and had a jolly good time sharing the telescope. But we soon found out about full Moon nights. These are not good times for astronomers at all. The moonlight would get into the telescope and contaminate the signal from our stars. We decided to pass the nights by taking measurements of random things, including the moon itself. Its around this time that I had an idea. I thought that if I would make a spectrum of the Moon and one of the Sun, then I would determine how reflective the moon is at different wavelengths. But it turns out that the moons surface is made of grains bigger than the wavelengths I could measure by borrowing the spectrometer Tarak was using. So, the Moons albedo, as it is called, had not much wavelength dependent effect that I could measure. So I had essentially been measuring sunlight in the night. I still wanted to check. But you cant point your telescope at the Sun. The Sun saturated the spectrometer even if one pointed at it with the naked optical fiber, feeding the instrument. I could not get a spectrum of the sun. The closest I could point the fiber without saturation was still skylight, not sunlight. So, I ended up with a spectrum of the Moon which is the spectrum of the Sun times the Moon’s albedo which is essentially independent of wavelength. I also had a spectrum of skylight which is again the spectrum of the Sun times the Rayleigh scattering cross section of stuff making up our atmosphere. 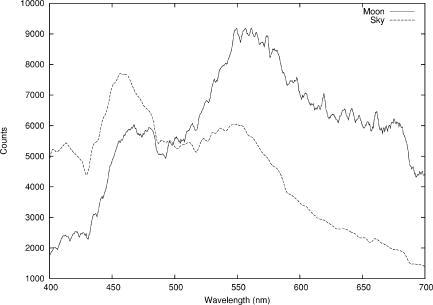 Notice how the spectral peak from skylight is noticeably at bluer (shorter) wavelengths than that from moonlight. Both spectra are un-calibrated but they passed through the same instrument. So if you divide one by the other, you are left with the wavelength dependence of the Rayleigh scattering cross section. We had learned in Physics classes that this is a very steep function, inversely proportional to the fourth power of wavelength. The sky supposedly appears blue because Rayleigh scattering is much more effective at bluer (shorter) wavelengths than at redder (longer) ones. So, I divided the skylight spectrum by the moonlight spectrum and got a weird curve. One of the important things that I remembered from my Physics classes was to use log-log graphs to make unwieldy power-laws into manageable straight lines. This one turned out to have the correct slope. I was very happy, I had demonstrated to myself that the sky was indeed blue because of Rayleigh scattering. I wrote up a paper for the American Journal of Physics describing how other students can try it out themselves and explore further. 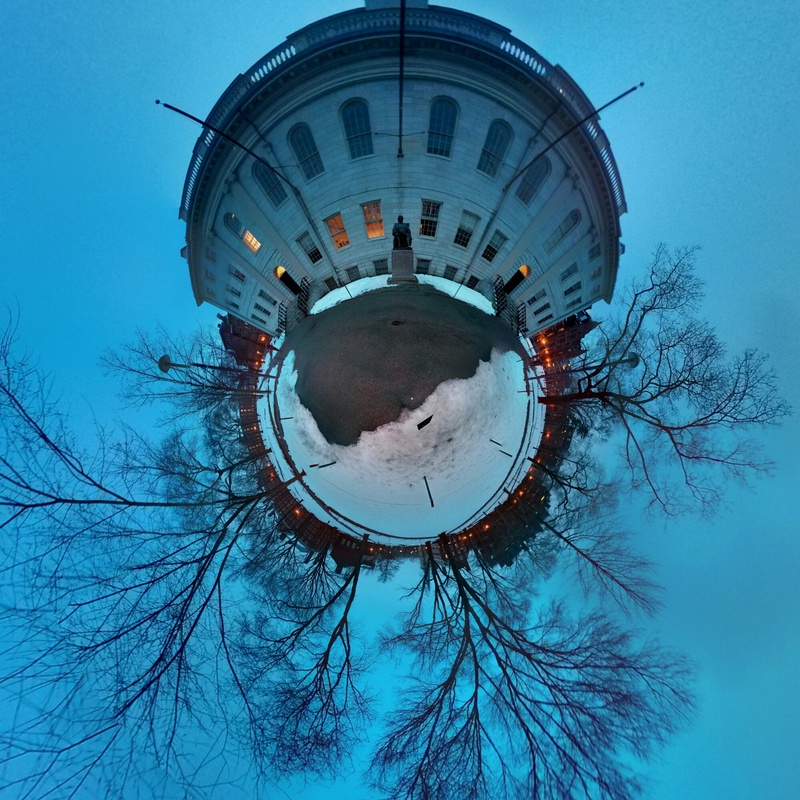 Image Posted on April 1, 2013 by Sayan Chakraborti CommentsNo Comments on Hello world!